The next Thunder? Not quite. 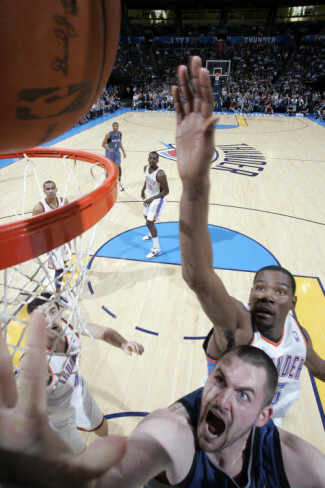 Undoubtedly, both teams have franchise players in Kevin Durant and Kevin Love. But, the difference between the two is stark. KD is probably the second best player in the league, and the two-time defending scoring champ. He scores at will, and can create his shot. K. Love is the Big Fundamental. He puts up impressive numbers, but he is not the elite score like KD and struggles at times creating his shot. His numbers have improved this season, but it’d be hard to deny the fact that Rubio’s presence has helped him get better looks. Now, I understand K. Love brings more to the table with his rebounding. But, the bottom line is they are completely different players. Its like saying the Packers and Vikes have similar franchise players in A-Rodg and AP. Similarly, the article focuses on two complete opposites at point guard. Westbrook is a scoring point guard who uses his elite speed to get to the rack. Rubio might already be the best passer in the league (tell me the last time you recall seeing someone deliberately pass it between a defender’s legs to a spot-up three!) Both bring excitement to the squad, but in completely different fashions. The worst comparison is claiming both teams hit on International big men after the lottery. First, Serge Ibaka was the 24th selection in the 2008 draft, while Pekovic was the 31st selection (also known as the first pick of the second round). Ibaka is a defender first, averaging 2.4 blocks per game – good for third most in the league. Pekovic has 5 blocks the entire season. Ibaka is also a freak of an athlete. Remember, he was in the Slam Dunk contest last season. Pretty sure Pekovic doesn’t know how to jump off one foot. Now, this isn’t intended to slam Pekovic. He has played well of late, and really done a nice job on the offensive glass. Frankly, it’s to early to even say the Wolves “hit” on drafting Pekovic, especially if you consider DeAndre Jordan was taken four picks later (and incidentally immediately after the Wolves drafted and then traded Mario Chalmers). Regardless, the two players are simply not comparable. Kahn won the bidding war for Darko Milicic. Finally, and most importantly, the article neglects to discuss the fact that OKC has surrounded their star players with a great core. OKC signed Thaba Sefolosha away from Chicago, and fills the role of defensive stopper. James Harden, another top draft pick, is turning in a Sixth-Man of the Year type season. And they traded away young, solid players (such as Jeff Green) to nab Kendrick Perkins from the Celtics. Meanwhile, well, I’m pretty sure there is a new adjective for how the Wolves have been built: KAHHHHHHHHHHHHHHHHHHHHN!!!!! To put it nicely, Kahn hasn’t quite built the team in similar fashion. Outside of drafting (and patiently waiting out the two years) Rubio, Kahn has unfortunately whiffed on most of his draft picks – Jonny Flynn (instead of Steph Curry), Ty Lawson (who was immediately traded), Wes Johnson (instead of DeMarcus Cousins – yes I know he’s a mental midget, but Sactown is so dysfunctional, who knows if he would have responded to K. Love’s leadership and Adelman’s coaching), Nick Calathes (instead of drafting Wes Matthews who went undrafted – sorry, I have a weird, unnatural man-crush on this solid, nothing special Madison native), and they drafted a guy from Senegal (Hamady N’Diaye) that proved to be a few years older than they had thought – kind of embarrassing. Further, Kahn signed two point guards in back-to-back summers to essentially the same deal – Ramon Sessions and Luke Ridnour. He paid $20M to Darko Milicic – yep, that’s the same Darko you’re thinking. Otherwise, the roster is full of players that make for solid 7th to 10th men off the bench. Who knows how Beasley, a.k.a. the Black Hole, fits in with Rubio and the new system. (Full disclosure, I like his role coming off the bench in these past few games. He is one of the few players on the squad that can create his own shot, and is a nice fit for the second team players.) Needless to say, the motley crew of “other players” Kahn has assembled to go with his stars is not quite on the same page as OKC. 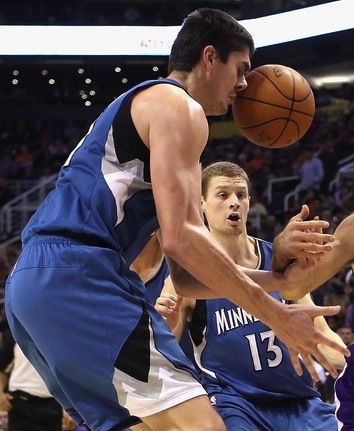 There is no doubt that the Wolves are improving… finally. But, they are not the next Thunder. Thankfully the Wolves have another top pick in this draf… oh wait, MCHAAAAAAAAAAAAAAAAAALE!!!! !